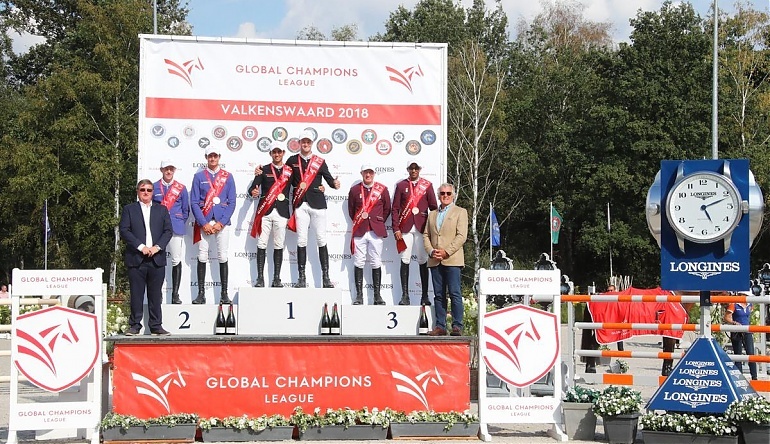 The battle for the 2018 GCL Championship has intensified with Valkenswaard United dramatically closing the gap to overall ranking leaders London Knights. Rome Gladiators’ Constant Van Paesschen and Marlon Zanotelli powered to GCL Valkenswaard victory after a pivotal weekend in the Championship fight, after United failed to secure a double clear. With today’s flawless performance, the Gladiators have leapt up to third in the overall standings, where they will be looking to cement a place in the top four and a fast-track ticket to the GCL Super Cup semi finals. Despite recording their worst score of the season, the Knights keep hold of the overall ranking lead, but rivals United are now only 18 points behind with their second place score today - compared to a 38 points difference only a week ago. Uliano Vezzani’s course was a thoughtful, flowing track, using the full width and breadth of the expansive sand arena. The Italian course designer provided the riders with plenty of options, with choices of strides to many of the combinations, and the chance to take tight turns. A curving line to a GC oxer at fence three caught out those who took the turn too tight, and the final line was a gutsy gallop to the finish, with some even opting for seven strides despite it walking eight or nine. This was a track best suited to larger-striding horses, careful at the fences but able to cover the ground effortlessly in the distances between. First to enter the ring were overall leaders London Knights, the team starting Saturday on the back-foot with a score of 12 carried through. The only option for the team was to secure a double clear, and the team made a strategic swap to have anchor Ben Maher and Winning Good to kick start their campaign. But there was a shock result as the pair took on the final line, the first part of the combination falling, before the final fence came tumbling down to add another 8 points to their already large score. Shaking his head in disappointment, Maher handed the reins to teammate Martin Fuchs and Clooney, who delivered a clear, but it would be a day at the office to forget for the Knights. The course proved tough, with faults collected all over the field and the final line tumbling time and time again. While one teammate often went clear, the other added faults to the score, with an elusive double a tall order for today. Doha Fursan Qatar carried through one time fault, but there would be further heartbreak for the team after Bassem Hassan Mohammed clipped the final fence with Gunder, putting the team on a total of five as groans erupted around the arena. Teammate Michael Whitaker pulled out another clear with El Wee Widge, the team on five with those on clear yet to come. Pressure was on the Rome Gladiators who took the mantle with Constant Van Paesschen and the enthusiastic stallion Jilbert van 'T Ruytershof clearing the fences effortlessly, slow but clear. Marlon Zanotelli made a strategic horse change, now riding Sirene de la Motte, the pair also opting for a steady pace. The pair delivered, the first double clear of the day, and with both riders pulling out a flawless performance this weekend to shoot to the top of the leaderboard. There was drama for the Eagles after Philipp Weishaupt collected 8 faults for the team, plummeting the Eagles down the order even before Christian Kukuk could take centre stage. But there was further drama after Kukuk and Limoncello stumbled, the pair taking a tumble on the final line but both up on their feet instantly. However this meant the team would be eliminated, with just three teams left to go and the Gladiators still leading. Scandinavian Vikings put forward anchor Christian Ahlmann with Tokyo installing confidence in the team with yet another clear before Leopold van Asten and VDL Groep Beauty took to the arena. But a disastrous 12 faults meant they would drop off the podium and out of contention. The pressure proved too much for the Cannes Stars, the team so desperately hoping for a strong result today. One down each for both Karel Cox, who swapped to top horse Evert and Sergio Alvarez Moya with Carlo meant they too would finish today off the podium. So all eyes turned to Valkenswaard United, the home team in prime position and looking to deliver another double clear. First in was Marcus Ehning with the speedy stallion Comme il Faut, the pair flying around the arena and shaving an impressive five seconds off the time to beat. Alberto Zorzi took to the arena, the final rider to go in what’s been another thrilling GCL event. Riding Fair Light van't Heike, the Italian star looked as though he was opting for a steady clear. But there was dismay after a single pole fell, handing the win to Rome Gladiators and the United team slipping into second. So the Knights keep their overall ranking lead heading into the penultimate stage of the Championship, with United in second, and the Gladiators in third - the green team looking strong ahead of their home event in Italy's capital city next month. Jan Tops, GCL Co-Founder: "Yes it’s a special place for me of course, it’s where I was born and we had a vision for many years to build this. It’s a great team, every day working here, and I’m very proud of them. To see this develop is a great pleasure. Every round, every year, is getting more exciting in the team competition. I experience myself all the time now also talking to the people how exciting the whole week is - the strategy, who’s going to put in which horses and riders. There’s so much behind the scenes that people don’t see. It's amazing to see the evolution. It’s different - not only the traditional way which is also fantastic, but to see something new, the owners love it and the public, it’s fantastic to see. "We have two stages left - Rome and Doha, and then Prague in December. The first two teams are pretty safe to go to the GC Play Offs. Its nice to see how the Rome Gladiators have moved themselves up to third place. They would like to secure themselves in the semi-finals. Next time it will also be their advantage it's their home place in Rome at our next event. So it’s pressure everywhere. And even like I said in London, you know on the bottom everybody wants to go to the finals so there is still a lot of excitement there as well." Michael Whitaker, Doha Fursan Qatar: “My horse is jumping really good and I think Bassem was very good too. But I think it was overall a great result." Marcus Ehning, Valkenswaard United: “It worked very well for me, yesterday I was clear and today was wonderful. Alberto had a really unlucky fault, otherwise we would have had five points more. But I think like this we make a good step forward and we are still fighting to be number one at the end of the season. Yesterday’s [result] was half time so nothing winning and nothing losing, but a very good position and we made a good climb instead of London Knights so I'm very pleased with what we’ve done today. If you have a clear round in mind for the team it’s much more pressure. It makes it very exciting and interesting and I think it’s a top sport." Marlon Zanotelli, Rome Gladiators: "Rock n Roll was jumping many clear rounds on the first day for the teams so it seemed to work pretty well and I’d say that today Sirene jumped amazing so I’m very pleased. For sure we will try to stay there, and stay in the top four - that’s the main goal now. For sure we have a lot to talk about [in terms of strategy] in a couple of weeks!"